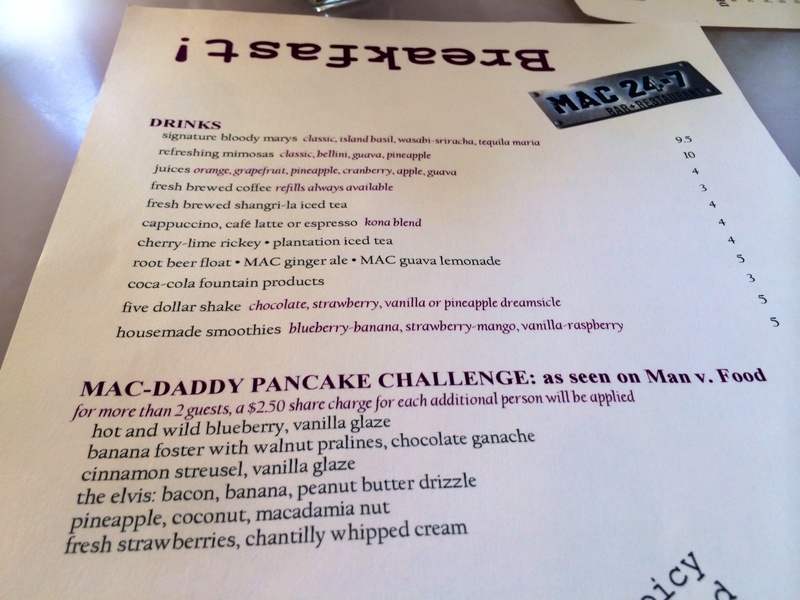 Vanessa: I contemplated for a while whether to share our experience trying to take on the Mac 24/7 ‘ Mac – Daddy Pancake Challenge’ on our recent trip to Hawaii. 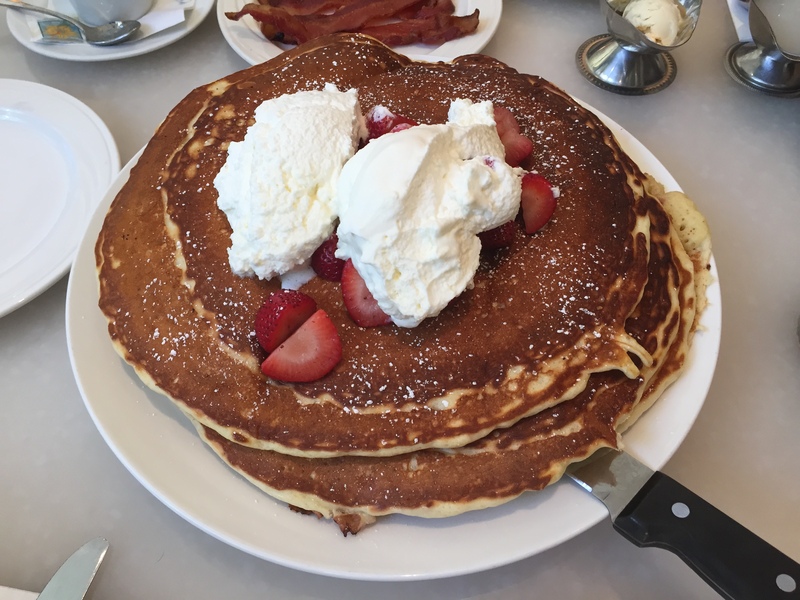 For one this is an overly indulgent, calorie laden, mammoth pancake stack so the guilt factor was high afterwards but also because we were defeated…and there were four of us! Despite that we certainly had fun giving the challenge a go and hence why I’ve decided to share the experience. Mac 24/7 is located within the Hilton Waikiki on Honolulu. As the name suggests it is open for business 24 hours a day serving all sorts of American favourites and some very oversized pancakes. Now I should make it clear that you can order regular pancakes off the menu without doing the challenge, but prepare yourself for the portion size. So on to the challenge. Some of you may have seen the host of Man vs Food take this on and fail, which was the real driving force behind us giving it go. So knowing that, there was no way we were going to attempt this solo and opted for the strength in numbers route. To qualify for the ‘Challenge Hall of Fame’, a t-shirt and the cost of the pancakes waived, one person only must finish the entire three stack of 14 inch pancakes in less than 90 minutes. We were willing to forgo the fan fare just to see how far we could get. We chose a toping of strawberries (the healthy option), whipped cream and two syrups on the side, maple and coconut. 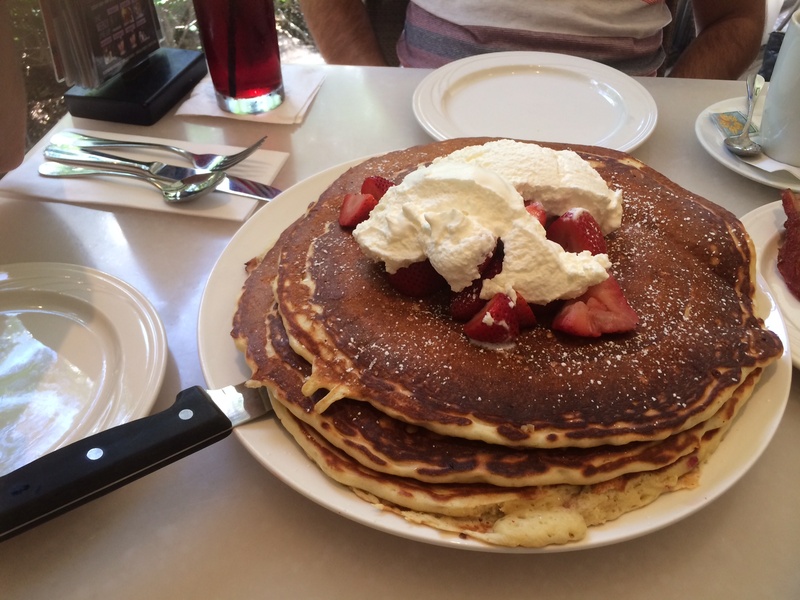 When we saw the waiter wheel out the huge stack of pancakes , we knew we had our work cut out for us. We took the sensible option of cutting the pancake up and each taking a portion. We all commented on how delicious the taste of the pancakes were. They had strawberry slices cooked into them which gave it a thicker consistency, which would be fine if we weren’t eating that much of it!! We managed to get through close to two-thirds of it before calling it a day. Feeling beyond full and on a collective sugar high we left for the comfort of Waikiki Beach where we could lay about for the rest of the day. Whoah that looks incredible. Can’t imagine anyone polishing off this plate on their own! Neither could I until I saw a whole wall of people that (apparently) had done it!! Insanity!